"Why don’t you paint the sights of Berlin!" How often I have heard this sentence. But then I live in Berlin, so they are not all that far away. However, to paint I need the free time, the best possible weather – and also the right point in time. 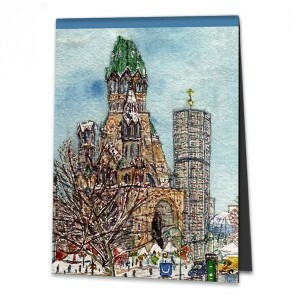 I have often walked around the Kaiser Wilhelm Memorial Church, looked at it from every perspective and have long had my favourite spot. As there is a big tree that hides the church most of the year, it has long been clear to me that this picture could only be created in winter. And then the day came: I had the time, the inclination, the weather was wintry but not too cold, the tree had no leaves, and so I plonked myself down in the famous Berlin Boulevard Kufürstendamm in a good mood. In my left hand, was my watercolour box with my water dish and a small block of paints and in my right hand was my brush. But it was not simple: cars pushed along the street in front of me, there were people on the pavement behind me, and the noise level was very high. The desire to paint was sucked out of me like the air from a popped balloon. But I did not want to give up so easily. Perhaps I could, rather rudely, press someone’s buzzer and ask if I could paint from the window of their flat? I turned around. Behind there was actually a bay window on the first floor with the right view. I had to go there! On the ground floor there was an H&M, perhaps I would be lucky? I went in and discovered an escalator at the back of the shop that led upstairs. Upstairs a nicer, airier space awaited me and – I could hardly believe this – a bench in front of ‘my’ window. It was free and was easily moved to the window. The store manager had no problem with my sitting and painting there and so I painted the picture in peace,quiet and comfort. From then on I knew that I do not just need the time, inclination, nice weather and the right point in time to paint, but also a large dollop of luck.